Score some points with these easy oven-baked chicken wings. 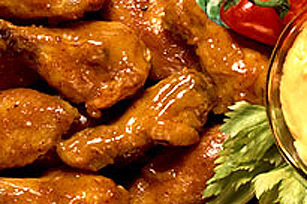 Tossed with barbecue sauce and a dash of hot pepper sauce, these saucy chicken wings are served with a side of creamy peppercorn ranch dressing for dipping. COVER a baking sheet with aluminum foil; place wings on prepared baking sheet. BAKE chicken wings for 20 minutes. POUR barbecue sauce and a dash of tabasco sauce over wings. BAKE an additional 20 minutes. Serve with KRAFT Peppercorn Ranch Dressing.